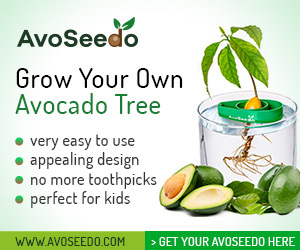 Avocado and Smoked Salmon Sushi - AvoSeedo - Grow your own Avocado Tree! If you love making sushi at home, this recipe is what you need. It makes healthy bites perfect for lunch. Cook rice in a pan of water until tender. Stir in sugar and vinegar; cover and let cool. Peel, pit and cut the avocado into small slices. Put the avocado slices into a large bowl; drizzle with lemon juice and stir gently until well coated. Divide the cooked rice between nori sheets, spreading evenly. Lay salmon over rice; top with chives and avocado. Fold the edge over the filling and roll up firmly. Repeat to make four rolls. Wrap the roll in cling film and refrigerate until ready to serve. Cut each roll with a serrated knife into eight rounds and serve with sweet soy sauce. This entry was posted in Recipes and tagged chive, rice, salmon, seaweed, soy souce, sushi, vinegar.